KUALA LUMPUR, 18 September 2014 – There is need to master the English language, the de facto scientific language of the world so as to keep up with the changes to technology that is advancing very rapidly. 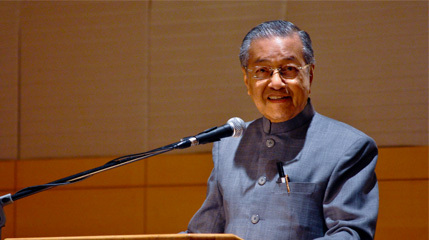 Former Prime Minister Tun Dr Mahathir Mohamad said those who are not proficient in English will be left behind in the technological race. Delivering his keynote address at the Malaysia-Africa Summit 2014, here today, which was also participated by The National University of Malaysia (UKM), Dr Mahathir said being proud of the national language do not mean that the Malays do not need to be good in English. “Malay, as a knowledge of global communications, is not as competent as English which has become the Lingua Franca of the world. Whether we like it or not, it is now the language of knowledge and communications,” he said. He said the British had introduced their language in all their conquered territories which had many tongues but eventually used English as the main language of communications and administration. Besides upholding the national language, he stressed the importance of comprehending knowledge as it is expanding rapidly in the academic world. He said people from many countries with many languages could take part in the summit proved that English is very important to global communications and scientific research. Dr Mahathir, who is honorary President of the Perdana Leadership Foundation, advised researchers and scientists to be proficient in at least two languages; the mother tongue and an international language. The one-day summit, with the theme “Enhancing Malaysia-Africa Engagement: Reshaping the Global Discourse on Education and Development”, sought to promote greater engagement between Malaysia and Africa by providing an avenue for greater academic exchanges between Malaysian and African scholars via bilateral and regional collaborations. It was organised by the Education Ministry through the Global Research Programme of Education Malaysia with the collaboration of Africa-Asia Development University Network and research universities including UKM.